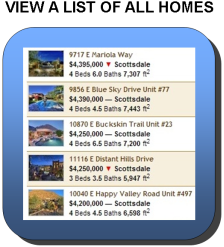 From this page you can easily browse all Sandpiper townhomes, condos & patio homes for sale from the Arizona MLS. Our real estate listings are updated daily! 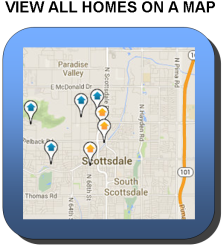 To begin, simply click on your choice of buttons below to view a list of all patio homes, or to view properties by location on a map. Square Footage: 1,752 sq. ft. - 3,008 sq. ft.
Scottsdale Sandpiper is served by the Scottsdale Unified School District #48. Parents outside of the Scottsdale Unified School District (SUSD) boundaries, or those already enrolled and choosing another SUSD school, may enroll their child in an SUSD school based on the school’s grade and program capacity. See the SUSD website for further details. Scottsdale Sandpiper is located adjacent to the McCormick Ranch Golf Club, and is a 3/4 mile walk from the front gate of the community. Other courses in close proximity are the Scottsdale Silverado Golf Club, Gainey Ranch Golf Club, and Camelback Golf Club. You won't see another community like Sandpiper built in Scottsdale anytime soon. Today, developers maximize profits by building as many homes as possible on a parcel of land. Sandpiper by contrast has an abundance of open space, lush green grass and fruit trees. Some of the homes in this resort-style community have views of the golf course, lake and Camelback Mountain. There are 8 community pools, or one pool for each 20 residences. Location? Excellent. Sandpiper is just minutes to world-class dining, shopping, golf, Old Town Scottsdale, cultural activities, walking paths and the new Diamondbacks spring training baseball stadium. Unlike most gated communities that simply have a keypad for entrance, Sandpiper's gate is manned 24 hours a day, 365 days a year by a security guard. The drawback of course is that employing full-time security guards is expensive and contribute to the higher than average homeowners association dues. In addition, a full-time on-site manager provides immediate attention to residents' needs. Want to sell your patio home in Sandpiper? Please Contact Us for your complimentary home value estimate, or to schedule a consultation. Get to know Scottsdale Sandpiper in 53 seconds with our community tour uploaded to YouTube in HD.